Sign-up to receive the latest information about the 2019 competition. Congratulations to the winning teams and to all of the finalists for their hard work and innovative solutions! Announcing the Final Four Teams for the 2018 IAH Competition! Thank you to all teams that participated in this year’s IAH Competition, and congratulations to the final four teams! We look forward to seeing the innovative Phase II solutions in Washington, D.C.
Congratulations to the winners, and to all the members of the final four teams on their outstanding solutions! Thank you to all the teams that participated in this year’s competition, and congratulations to the finalists! Read the full announcement. The site for the 2017 IAH Competition is Woodhill Homes, a 478-unit multifamily property located in Cleveland, Ohio that is owned and operated by the Cuyahoga Metropolitan Housing Authority (CMHA). 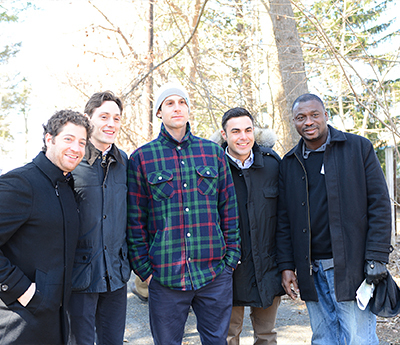 The graduate student team from New York University (NYU) is the winner of HUD’s second annual Innovation in Affordable Housing Student Design and Planning Competition. The NYU team developed a plan for the redevelopment of a senior affordable housing high-rise in Houma, Louisiana. HUD also announced a team from UCLA as the runner up. Thank you to all of the teams that participated in this year’s competition, and congratulations to the winners! If you were unable to attend the event, the webcast in its entirety is now available online. 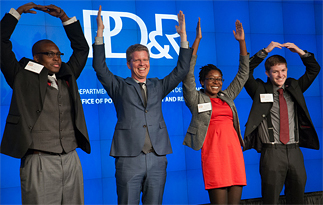 You can watch the four finalists present their innovative solutions, hear the teams respond to questions asked by the jury, and see the exciting conclusion of the competition as Assistant Secretary of HUD Policy Development and Research (PD&R) presents the awards to the first- and second-place teams! Watch the webcast here. 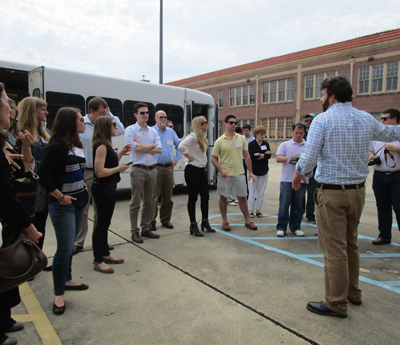 On Wednesday, March 18, 2015, the four finalist teams competing in the 2015 Innovation in Affordable Housing Student Design and Planning Completion, gathered in New Orleans, LA for a visit to the competition site. 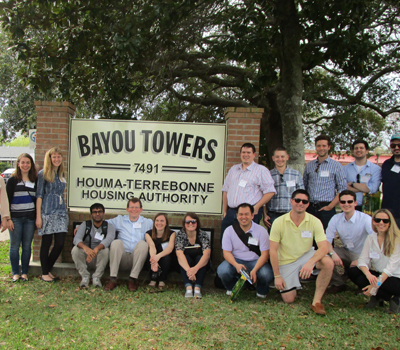 After a stunning drive into Bayou Country southwest of NOLA, the teams were graciously hosted by Wayne Thibodeaux, Executive Director of the Houma Terrebonne Housing Authority and his staff. Settling into a meeting room at Bayou Towers after coffee, doughnuts, and local snacks, the teams had the opportunity to hear from representatives from HUD headquarters, HUD’s New Orleans Field Office, the Terrebonne Parish Consolidated Government, Terrebonne Council on Aging, and the Golden Agers Resident Council. 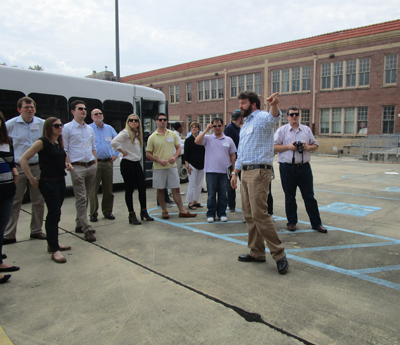 In the afternoon, the group was taken on a two-hour tour of the City of Houma, stopping at various new and planned housing developments, a senior center, and local sites. 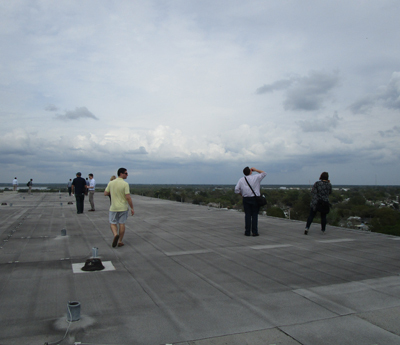 Wrapping up the day, competitors were guided through an extensive tour of the existing building, led by the Bayou Towers’ Asset Manager and Maintenance Supervisor, which included viewing several apartments as well as the mechanical rooms. 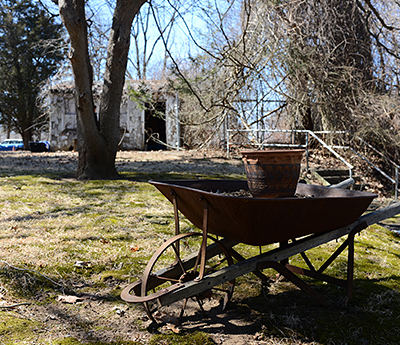 The trip provided significant insight into the community, the population served, and the challenges to be met. All parties are looking forward to the Final Four Jury and Award Presentation next month in Washington, DC. 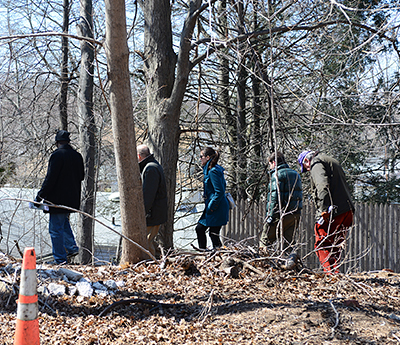 Many thanks to all who contributed to making this site visit such an overwhelming success. 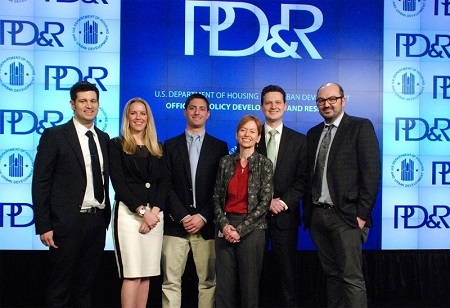 The graduate student team from Ohio State University is the winner of HUD’s inaugural Innovation in Affordable Housing Student Design and Planning Competition. 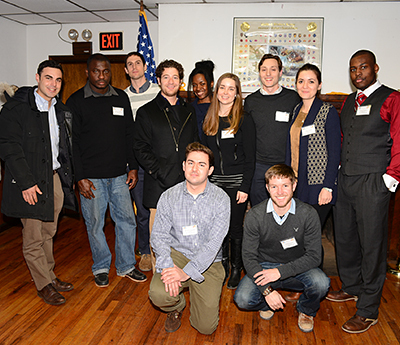 The competition challenged students to create a plan for the development of a Revolutionary War-era structure in Bergen County, New Jersey into new permanent supportive housing for homeless veterans. HUD selected a collaborative team from New York University and Columbia University as runner up. 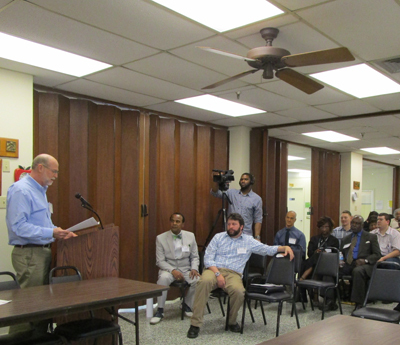 Read the press release and view event photos. 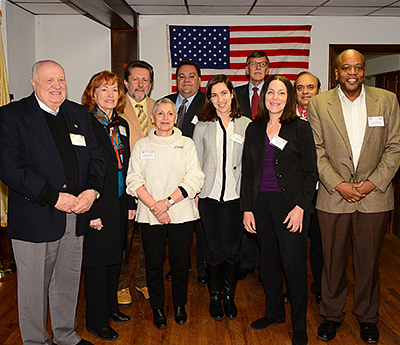 HUD PD&R would like to extend a special thanks to the Housing Authority of Bergen County (HABC), the Housing Development Corporation of Bergen County (HDC), and the American Legion, for their participation in the competition. 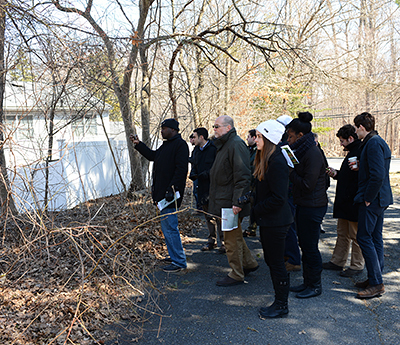 On March 26, 2014, the four student finalist teams traveled to Emerson, New Jersey, to visit the project site. 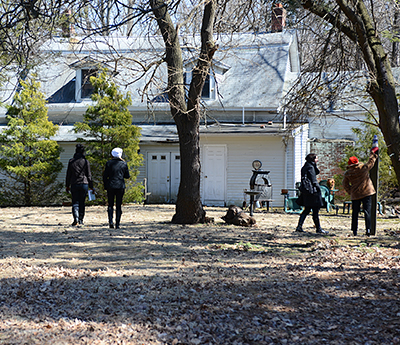 The site visit provided a valuable opportunity for students to walk through the site, study its topography, and see the surrounding neighborhood. 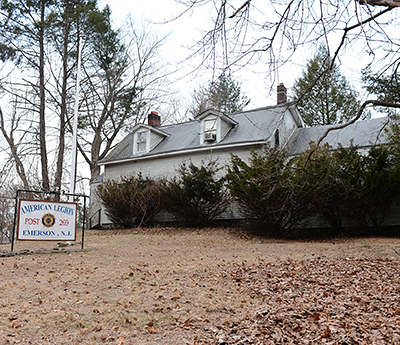 Students were also able to see the American Legion building’s historic elements firsthand, including the original house built in 1770, which now serves as the kitchen. The site visit also served as an opportunity to discuss the second phase of the competition, in which the finalists will be asked to further refine their plans and innovative solutions for the project site. 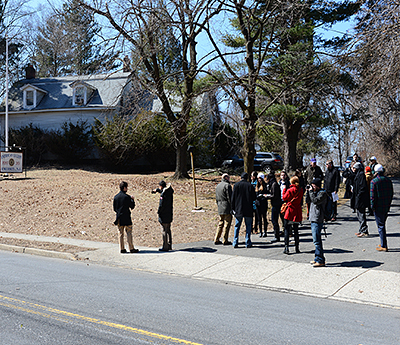 Finalists will present their plans at HUD’s Washington, DC headquarters on May 6, 2014, where the jury will make its final selection of the winner and runner-up teams. HUD Secretary Shaun Donovan will announce the winners at the event. Graduate student teams from the New York University/Columbia University, New York University, University of Michigan, and the Ohio State University will compete in the final phase of the inaugural Innovation in Affordable Housing Student Design and Planning Competition. 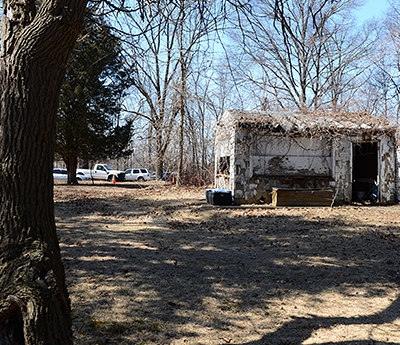 The four teams will make their proposals for development of veterans affordable housing in Emerson, New Jersey on May 6 at HUD Headquarters.